Application of water-based fluids with chemical additives for fracking operations to increase the productivity of petroleum reservoirs has caused problems both environmentally and technically. Increased water consumption, water handling issues and induced seismicity have adverse impacts on environment. In addition, slowed flow-back and fracture closure, phase trapping and lower effective fracture lengths lead to less ultimate recovery. To address these issues, stimulation with light alkanes – i.e. waterless fracking without chemical additives – is proposed. This innovative waterless fracking not only minimizes the environmental risks but also results in increased ultimate recovery compared to conventional water-based fluids – especially in tight and ultra-tight reservoirs – due to its characteristics of rapid flowback and fracture closure, compatibility with the reservoir (no phase trapping) and increased effective fracture lengths. With ever increasing energy demands and the finite nature of conventional petroleum resources, the development of unconventional petroleum reservoirs has contributed to maintaining the balance between supply and demand. One example is tight sands and shale, which are produced using water-based fluid fracking. There has been an exponential increase in the shale gas production over the last decade in the United States, for instance. The use of hydraulic fracturing as a well-stimulation technique has triggered many concerns such as increased water consumption, water handling issues at the surface and induced seismicity leading to severe environmental problems (Kohshour et al., 2016). Slowed flowback of water-based fluids results in delayed fracture closure and poor proppant placement, especially in the near perforation zone, and the flowback may continue for a year or longer, affecting recovery (LeBlanc et al., 2011). Water trapping, especially in water sensitive clays, and sands with sub-irreducible water saturation have devastating effects upon relative permeabilities and hence on recovery (LeBlanc et al., 2011). The fracture length and conductivity are also considerably lower for water-based fluids compared to waterless fracking fluids (LeBlanc et al., 2011). The increased usage of water is a result of increased exploration and production activity and of multistage hydraulic fracturing, especially in unconventional reservoirs. The increased water usage on a per-well basis is shown in Figures 1 and 2 (Kohshour et al., 2016). 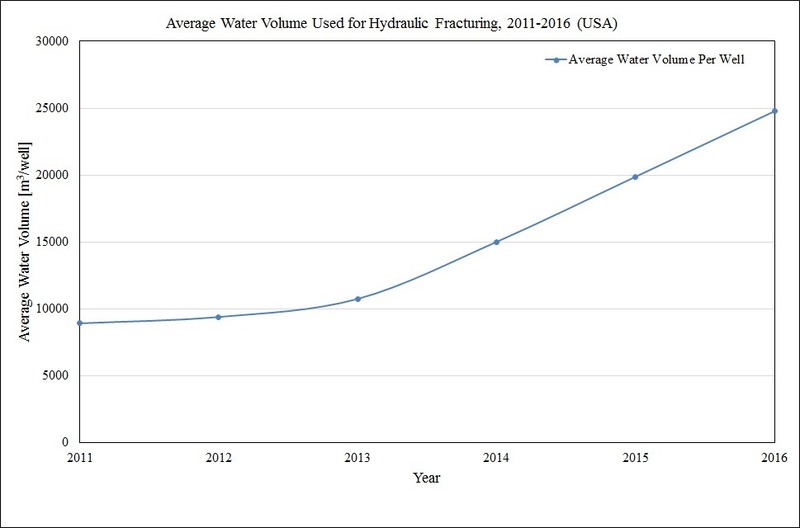 Figure 1: Increase in average water usage per well for hydraulic fracturing in the USA, 2011-2016 (Kohshour et al., 2016). 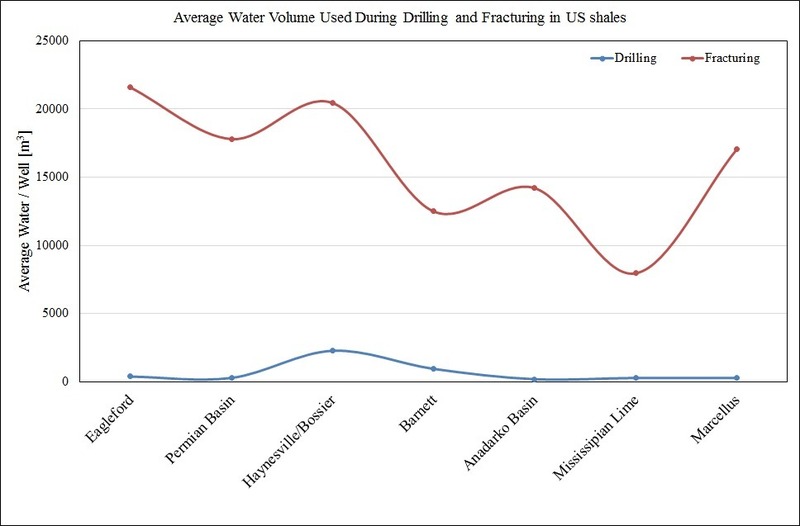 Figure 2: Water usage in drilling and fracturing in US shales (Kohshour et al., 2016). According to Rubinstein and Mahani (2015), waste water disposal (including the waste water from fracturing) is the main cause of recent increase in earthquakes. There are many fracking fluids available today, including foam-based fluids (such as CO2 based foams, alcohol based foams, oil based foams etc. ), oil-based fluids (such as diesel), acid-based fluids, alcohol-based fluids, emulsion-based fluids and cryogenic fluids (such as liquid CO2 and N2) (Gandossi and Estorff, 2015). LeBlanc et al. (2011) presented a study of hydraulic fracturing in the McCully gas field (New Brunswick, Canada) with liquefied petroleum gas (LPG), mainly propane, as the fracking fluid. According to their findings, propane (LPG) fracking was more successful in the McCully field than the previously done water-based fracking. A comparison between LPG-based fractures and water-based fractures is provided in Figures 3 and 4 (comparison based upon single fracture per well and comparable fracture job size). It is evident that the flowback of injected fluid in the case of propane-based fluid fracking was much quicker compared to water-based fluid fracking; the complete flowback of propane only took up to 10 days for all wells, whereas for water fracking it took more than a year for the complete flowback. Their results show a considerable increase in recovery from wells using propane-based frackingaround 1.5 times compared with water-based fracking and 3.8 times compared to when no fracking was carried out (LeBlanc et al., 2011). 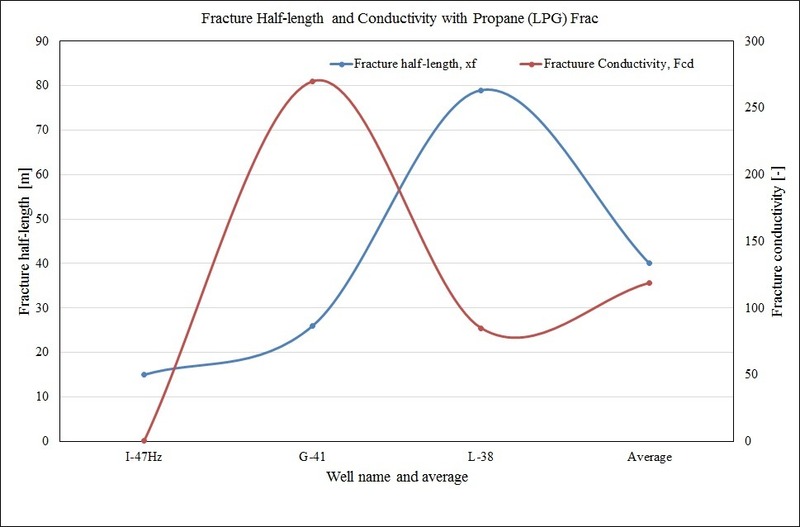 Figure 3: Fracture half-length and conductivity for propane fracking (LeBlanc et al., 2011). 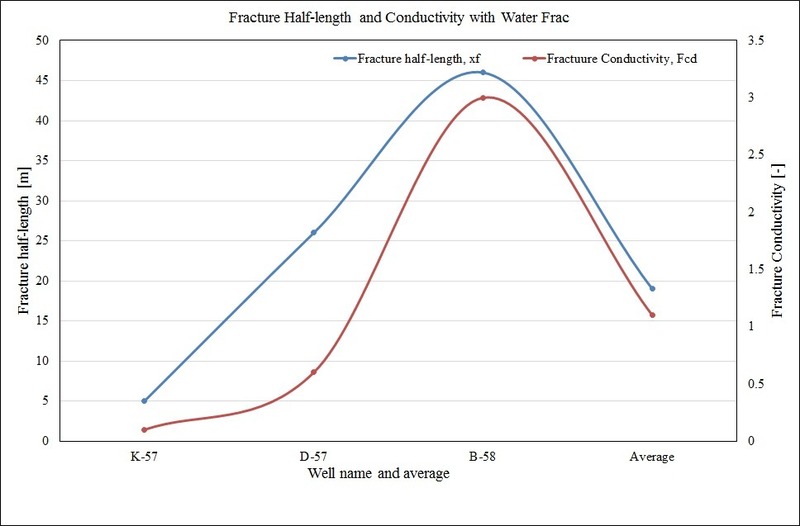 Figure 4: Fracture half-length and conductivity for water fracking (LeBlanc et al., 2011). However, the problem with LPG-based fluid is the surface handling of propane, which exists as a gas at surface conditions and is highly flammable. In 2015, eCORP Stimulation Technologies, LLC introduced Light Alkanes Stimulation (LAS) using mineral oil for stimulation. From the phase behaviour of mineral oil (Figure 5), it becomes evident that at most reservoir conditions it will remain in liquid phase. Mineral oil normally has a density range between 800–850 kg/m3, and because it may remain in liquid phase upon flowback, it is possible that its flowback may not be as quick as that of a gaseous phase. Figure 5: Phase behaviour of mineral oil (alkanes: C12–C35 (average), based upon literature study). Black arrow represents normal reservoir isothermal depletion conditions. The waterless fluids discussed above are either gas, which is difficult to handle at the surface, or liquid, which is denser and develops flowback issues. What would be ideal is a waterless fluid that can be handled as liquid at the surface – thereby giving the advantages of easier surface handling – and on its flowback after fracturing the target reservoir formation, it changes its phase to gas under low pressure wellbore (bottom-hole) conditions (such as after the nitrogen lift operation that reduces the hydrostatic pressure created by the fluid column) to add the advantage of quick flowback in the gaseous phase. Also, a complete numerical simulation of the multi-phase multi-component hydraulic fracture process is required with full3D software. The proposed fluid consists of light alkanes, but in this case even lighter components are chosen for fracking, such as alkanes (CnH2n+2) from C5 to C10 including n-pentane, n-hexane, n-heptane, n-octane, n-nonane and n-decane, respectively. Figure 6 shows the phase behaviour of the proposed fluid, which clearly shows that the proposed fluid will be in liquid phase at the surface and under high pressure fracturing conditions. The low pressure required in the wellbore and near wellbore regions for the fluid to change its phase at different reservoir temperatures upon flowback can be provided by the post fracture nitrogen lift operation and can also be observed in the figure 6. Figure 6: Phase behaviour of the proposed fluid. Black arrow represents normal reservoir isothermal depletion conditions. Alkanes (CnH2n+2) are naturally occurring hydrocarbons that are normally compatible with the reservoir fluids (hydrocarbons); therefore, the proposed fluid is likely to avoid phase trapping and formation damage, resulting in excellent flow efficiency of reservoir fluids. The density and viscosity of the proposed fluid are calculated using API standard correlations and presented in Figure 7. The fluid may need to be gelled with guar (a naturally occurring compound also used in food) to enhance its proppant carrying abilities. After proppant placement, the gel breaks down, resulting in the original low-viscosity and low-density fluid. The phase change to gas will result in quick flowback and efficient proppant placement, especially in the upper part of the fracture, due to quick fracture closure. The fracking fluid can be recovered at the surface and utilised for other fracturing operations. Therefore, there is no need for special waste fluid handling at the surface for the proposed fluid, as the fluid is waterless and without chemical additives. Hence, the environmental risks associated with conventional fracking fluids can be greatly reduced with the added advantage of increased recovery. The re-use of injected fluid will also help to reduce the cost of fracturing. 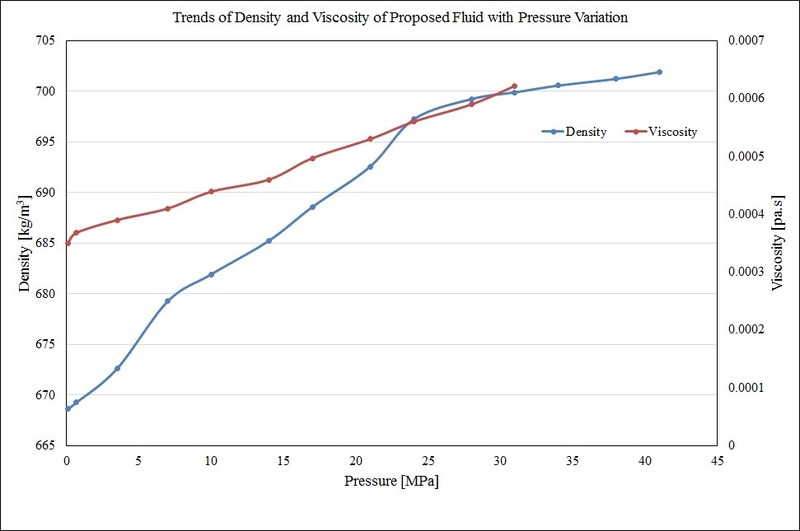 Figure 7: Density and viscosity trends of the proposed fluid. Numerical simulation is used to investigate the potential application of this innovative waterless light-alkane fracking fluid in a gas reservoir. The numerical simulation is performed by thermo-hydro-mechanical (THM) coupled FLAC3Dplus, an in-house upgraded version of FLAC3D. TOUGH2MP/TMVOC coupled with FLAC3Dplus can be utilized for multi-phase multi-component flow simulation (Gou et al., 2015). Figure 8 presents the detailed methodology in the form of flowchart. The following sub-sections provide brief details about the software. Figure 8: Flowchart showing the detailed methodology of complete numerical simulation. FLAC3D (Fast Lagrangian Analysis of Continua in three Dimensions) is numerical modelling software utilised for geotechnical analysis. To make it an efficient numerical simulator for hydraulic fracturing, in-house improvements have been made. Zhou and Hou (2013) introduced a new approach based upon the novel idea of considering 3D stress state in a 3D geometric model for fracture propagation with a fully hydromechanical coupling effect and integrated it into FLAC3D, making it FLAC3Dplus. Zhou et al. (2014) developed a new constitutive model for the description of discontinuous displacement field due to fracturing phenomenon such as fracture enlargement, closure and contact. Gou et al. (2015) introduced a new coupling approach with consideration of hydro-mechanical (H2M) coupled leak-off effects to couple multiphase multi-component flow simulator TOUGH2MP with FLAC3Dplus. Feng et al. (2016) introduced and implemented a new thermal module into FLAC3Dplus to numerically study heat transport and exchange during hydraulic fracturing between the fracture and neighbouring reservoir formations. Normally, Pseudo-3D models utilised in the industry only consider the minimum horizontal stress, whereas all principal (vertical, minimum horizontal and maximum horizontal) stresses are considered in FLAC3Dplus, making it a full 3D numerical simulator. TMVOC (belonging to the family of the TOUGH2MP simulator) is a numerical simulator for multi-phase (three-phase) multi-component non-isothermal flow of hydrocarbons; it has the capability to simulate multi-phase hydrocarbon flow. The three phases include water, non-condensable gases (NCG) and non-aqueous phase liquids (NAPLs). The flow behaviour can be modelled for all combinations of three phases including a maximum of 8 gases, 18 NAPLs and water (Pruess and Batistelli, 2002). To support the idea of new innovative fracking, first a flow simulation of proposed fluid is carried out to observe phase change using TOUGH2MP/TMVOC. In the first phase of research, a fictive model for a gas reservoir is developed to observe the phase change of injected fluid. The model details are provided in Table 1. Since the thickness of created vertical fractures is normally only a fraction of an inch, the model is given a small y-dimension of 0.5 m. Grid blocks with small width help to better understand the behaviour of the fracture as well as fluid flow in the model. A special high-temperature reservoir scenario (153 °C) is considered in the model to make its properties close to required wellbore and near wellbore formation conditions, such as those essential for phase change in fluid flowback as shown in Figure 6. Table 1: Properties of fictive model. It is a normal practice to opt for nitrogen lift operation after fracking for reduction of pressure in the wellbore (wellhead and bottom-hole) in order to ease the flowback of injected fluid. Our fictive model thus assumes a pressure of only 0.42 MPa in the near wellbore region. Initially, the proposed fluid is injected into the gas reservoir (fictive model) for a period of 10 hours at an injection rate of 2.7×10-3 kg/sec. A total of 97.2 kg of fluid is injected into the formation. Then the injection is stopped and injected fluid is allowed to change its phase under reservoir conditions. The simulation is performed for a period of fifteen days during which there is no production, so all of the fluid remains in the reservoir. 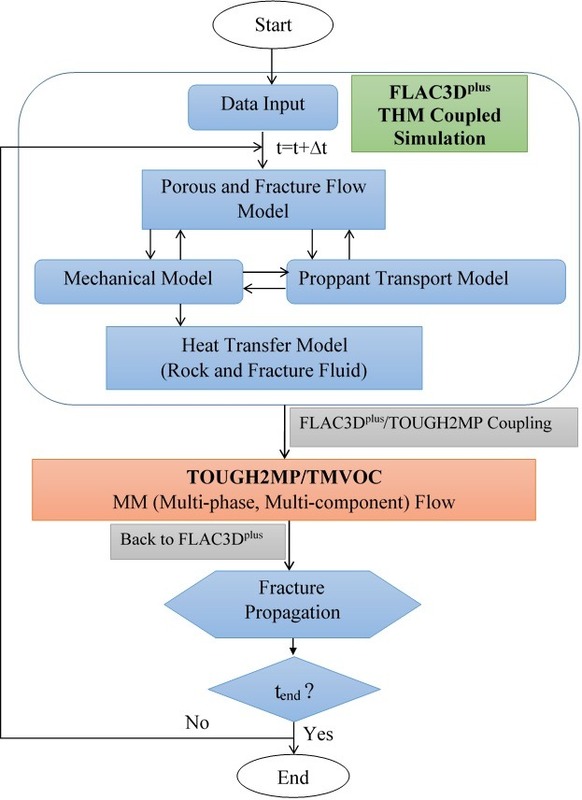 Based upon Figure 6, the conditions for phase change in TOUGH2MP/TMVOC simulator are met in the fictive model and results can be observed from Figures 9–14. Figure 9 represents the increase in the density of the gaseous phase with time. Initially the reservoir contains only reservoir gas; hence, at the given low pressure and high temperature near the wellbore region it has a density of only 1.979 kg/m3. 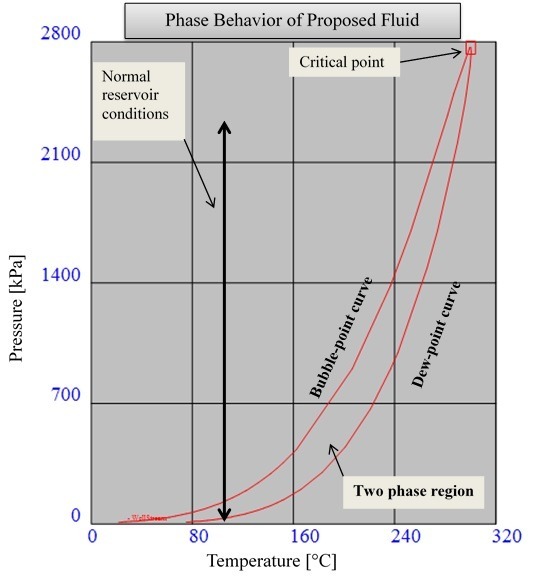 The proposed injected fluid starts to change its phase after coming in contact with the reservoir due to the pressure and temperature conditions of the reservoir. As components of the injected fluid vaporise, the gas density increases to a maximum of 15.56 kg/m3. The large increase of 800 % in the density of gaseous phase is due to phase change of injected fluid. Figure 9: Increase in the density of gas phase due to phase change of injected fluid (DGAS: gas density), star placed against point of injection, (a) at the start of injection, (b) at the end of injection, (c) after 7 days of injection and (d) after 15 days of injection. Similar results can be observed from Figures 10 and 11, showing the variation of injected fluid saturation in the gas and liquid phase, respectively. The increase in gas saturation indicates the phase change of injected fluid. At the end of injection (Figure 10(b)), the injected fluid in liquid phase can be observed in the blue to grey grid blocks (red grid blocks represent 100 % gas). However, at seven and fifteen days from injection (Figure 10(c) and (d)), it can be seen that the gas saturation has increased, especially in the zones which previously contained injected fluid in the liquid phase. Figure 11 shows the injected fluid saturation in liquid phase from the start of injection until fifteen days after the injection. The injected fluid occupies the injection zone and other nearby zones in the liquid phase during injection. Later on, the decrease in liquid saturation from 99.5 % to between 50-25 % in different zones shows the disappearance of injected fluid into its gaseous phase (Figure 11(c) and (d)). Figure 10: Increase in gas saturation due to the vaporisation of proposed injected fluid (SG: gas saturation), star placed against point of injection, (a) at the start of injection, (b) at the end of injection, (c) after 7 days of injection and (d) after 15 days of injection. Figure 11: Decrease in the injected fluid saturation in liquid phase due to its disappearance into gaseous phase (SO: fluid saturation in liquid phase), star placed against point of injection, (a) at the start of injection, (b) at the end of injection, (c) after 7 days of injection and (d) after 15 days of injection. 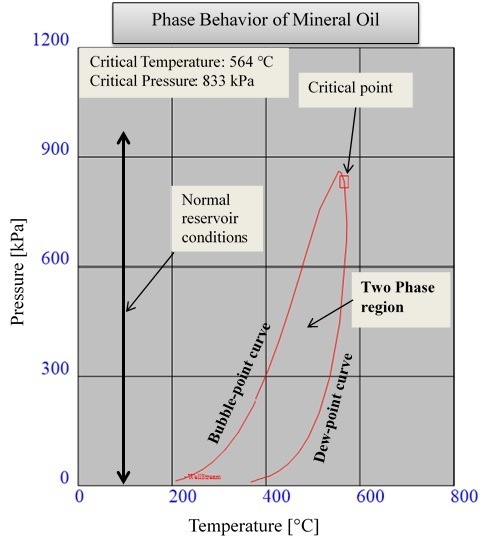 The complete phase change of the fluid is not observed in the current simulation because the assumed pressure and temperature in the model put the fluid in the two-phase region, as seen in Figure 6. If the pressure is further reduced to the single phase gas condition as in Figure 6, the fluid will completely change its phase. Figures 12 and 13 represent the change in the weight percent of individual components of the injected fluid in the gaseous and liquid phase respectively. As seen in Figure 12, n-pentane shows the maximum phase change with around 50 weight percent in gaseous phase at the end of 15 days after injection. The increase in weight percent of components in the gaseous phase in Figure 12 is confirmation of phase change. 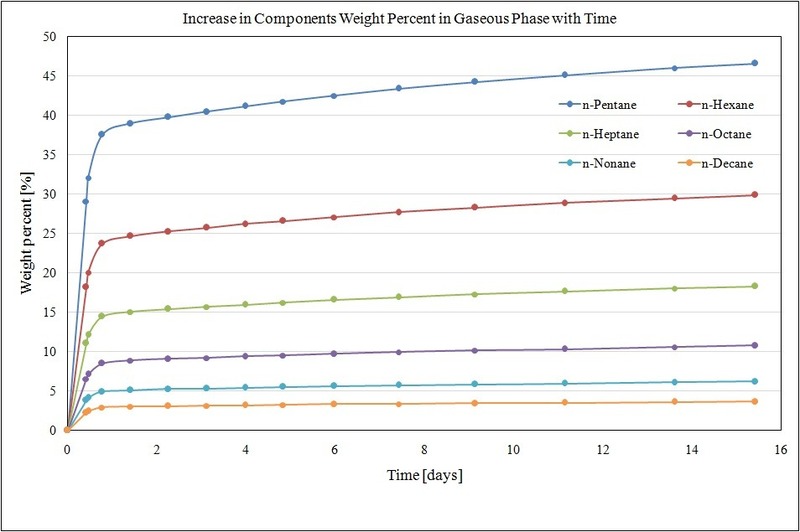 Figure 12: Increase in the weight percent of individual components of proposed injected fluid in gaseous phase with time. 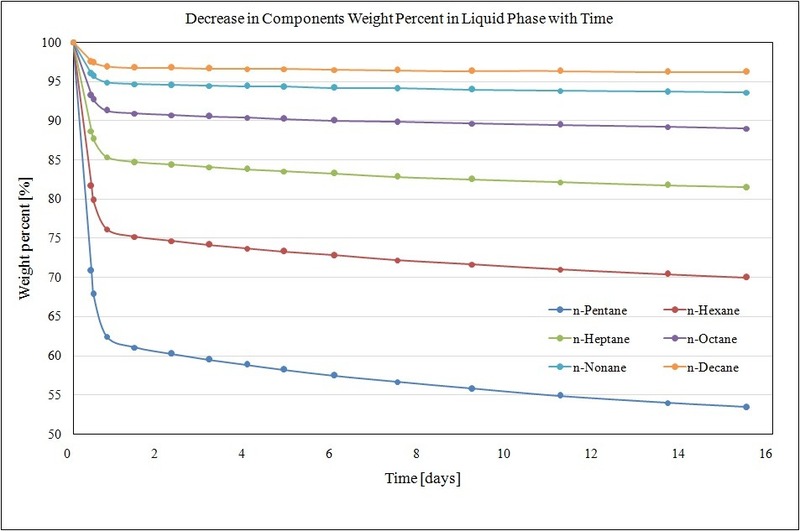 Figure 13: Decrease in the weight percent of individual components of proposed injected fluid in liquid phase with time. 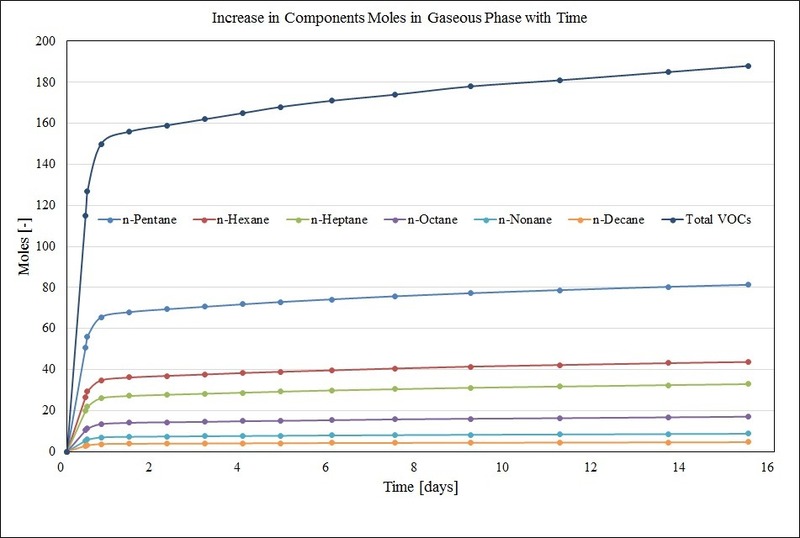 Similarly, Figure 14 shows the increase in the number of moles of individual components in the gaseous phase, presenting a similar trend as presented in Figure 12. The heavier n-decane and n-nonane– with molecular weights of 128 and 142, respectively – show minimum phase change under current conditions due to their lower vapour pressures. Figure 14: Increase in the number of moles of individual components of proposed injected fluid in gaseous phase. The phase change is quick initially and then slows down. Most of the phase change occurred within a period of two days. Based upon obtained results (Figures 9–14), the fluid has the ability to change its phase from liquid to gas under low pressure. Therefore, maximum and quick flowback of injected fluid is possible. The proposed fluid can be handled (through gelling, proppant mixing) with conventional surface equipment as it exists in liquid phase at normal surface conditions. However, care must be taken during surface handling because of the hydrocarbon’s flammable nature. Phase trapping can be avoided as proposed fluid has only light hydrocarbon components (n-alkanes, C5-C10), and is compatible and miscible with the reservoir hydrocarbons. Upon flowback, the fracking fluid can be separated from reservoir fluid. The difference between the boiling point of butane and pentane is about 37 °C, so at surface conditions the injection fluid is expected to be separated as liquid. One possibility for separation is flow through a separator. Otherwise, a more complex system including a stripper plant or fluid refrigeration may be required. Once separated, it can be reused for further fracking operations. Fluid reuse for subsequent fracking operations will not only reduce the cost of operation, but could also make it comparable with water-based hydraulic fracturing costs, especially in areas of water scarcity. The added advantage of increased ultimate recovery can make the economics of the proposed fluid reasonably attractive. As the fluid consists of six components, from pentane to decane, it is possible to design a variety of compositions in terms of mole fraction of individual components based upon different encountered reservoir conditions. The mole fraction of heavier components can be increased for fracturing in reservoirs where reservoir temperature is higher (in excess of 130 °C) and vice versa so that the fluid can change its phase to gas upon flowback for faster clean-up. Future research will include a complete numerical simulation of a hydraulic fracture job; i.e. a coupled TOUGH2MP/TMVOC-FLAC3Dplus simulation. In addition, FLAC3Dplus can perform numerical simulation for incompressible fluids; improvements need to be made so that the thermo-hydro-mechanical processes of compressible fluids may be simulated. Moreover, an economic analysis needs to be performed for fracking with the proposed fluid before performing hydraulic fracturing in a real test case. The current study is in the framework of the DGMK Gasfrac project. Kohshour, I. O., Leshchyshyn, T., Munro, J., Yorro, M. C., Adejumo, A. T., Ahmed, U., Barati, R., Kugler, I., Reynolds, M. and Cullen, M., McAndrew, J. and Wedel, D. 2016. Examination of Water Management Challenges and Solutions in Shale Resource Development – Could Waterless Fracturing Technologies Work? Unconventional Resources Technology Conference, August 1-3, 2016. Pruess, K., Batistelli, A. 2002. TMVOC, A Numerical Simulator for Three-Phase Non-isothermal Flows of Multicomponent Hydrocarbon Mixtures in Saturated-Unsaturated Heterogeneous Media. Report. Lawrence Berkeley National Laboratory. LBNL-49375.